In recent years financial services organizations have been struggling to increase profits and enhance shareholder value. Faced with a long list of challenges, from slowing economic growth and changing consumer tastes to increased regulatory scrutiny and margin pressure, smart firms are looking for new ways to lower costs and increase revenues. It’s time to take a strategic approach to spend management by streamlining processes and increasing efficiency. 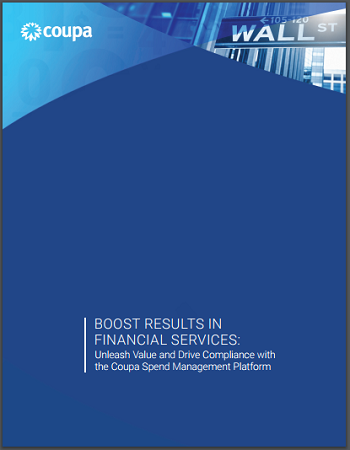 Coupa’s cloud-based Spend Management platform offers a smart way for financial services firms to increase visibility and control, improve compliance and manage risk, and lower costs to improve margins.